As a Michigan Driver’s License Restoration Lawyer, I handle Michigan Driver’s License Restoration Appeals. But I don’t do appeals to Court. More specifically, I do Driver’s License Appeals, but I don’t appeal Appeals. Confused yet? The idea for this article, clarifying what a “Michigan License Appeal” really is, and what it means to “Appeal” a loss came about earlier this week after Ann, my Senior Assistant, had a call from a lady who wanted to “appeal” a License Restoration case that someone else had handled, and, obviously, lost. Ann explained to me that it was confusing for some callers how the word “Appeal” is used all over the place in the context of a License Restoration. Once I stopped to think about it for a moment, it kind of became obvious that this confusion is rather well founded because of the imprecise use of the word “Appeal.” Worse yet, a Lawyer, like me, who handles “License Appeals” is as guilty as anyone for helping to proliferate the imprecise word use that only serves to muddy the water. This article will be my attempt to clear things up and clarify what is meant by the term “License Appeal,” although I will no doubt continue use the word “Appeal” imprecisely and indiscriminately. A Michigan Driver’s License that has been Revoked because of multiple DUI’s will remain Revoked until it is either “Restored” by the Michigan Secretary of State’s Driver Assessment and Appeal Division (DAAD), or until a person who now lives out of state obtains a “Clearance,” which is for all intents and purposes the same as a Restoration, except a person gets their License in a state other than Michigan. Once in a blue moon, a person who never even held a Michigan License can have their Driving privileges Revoked here if they pick up more than 2 DUI’s inside the state. Most of the time, however, either a Michigan resident wants his or her Driving privileges Reinstated (Restored), or a former resident needs a Clearance to be able to obtain a License in another state. Whatever the story, a person wants to clear things up. To do that, they must file for a Michigan Driver’s License Restoration or Clearance. Almost everyone calls this a “License Appeal.” And it is, but it’s not the only kind of “Appeal” that can be filed, and that’s where the confusion starts. This is a clear example of how imprecise word use confuses a situation. Fortunately, I can get away with such imprecise word use because I almost always win my cases, and don’t have to “appeal” my cases to Court. In fact, I even have a Guarantee that I will win, thus protecting anyone who becomes my Client from the risk of losing either their case, or their money. Thus, when the term “License Appeal,” is used without specifying if that means an original Driver’s License Restoration Appeal before the DAAD or an appeal from a lost DAAD Appeal, confusion results, especially because both terms are, technically speaking, correct. This means, them, that there are really 2 kinds of License Appeals, both covered by the same term, but meaning very different things. If a person loses their case, they can, of course, file an appeal. This is where the confusion usually surfaces: If you lose a License Appeal, you can appeal. As an aside, I will never pick up a case that someone else has lost. At best, I’ll tell the person to wait until their year is nearly up, and then call me so we can do it right the next time. At worst, they, or the Lawyer they used may have screwed things up badly enough that they’ll have to do more than just wait; they’ll have to repair the damage caused by their first attempt. Whatever the case, I don’t ever take a case someone else has lost and “appeal” it to Court. In order to clarify, then, I specialize in Michigan Driver’s License Restoration Appeals (or Clearances). These “Appeals” are Hearings held before the Michigan Secretary of State’s Driver Assessment and Appeal Division (DAAD) Hearing Officers. I do not, ever, “appeal” a case where someone has tried their own hand at a DAAD Hearing, or gone in with any other Lawyer, and lost. I suppose it can be made as simple as the capital “A” that I put before the term “License Appeal,” and the small “a” before the word “appeal.” A License Appeal is really a Hearing before the DAAD. 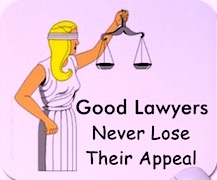 If a person loses there, they can “appeal” to a Court. If a person is genuinely Sober, and if I accept their case, they won’t be losing in the first place, and they don’t have to worry about “appealing” a lost “Appeal.” They will win their case the first time, or else they’ll have my services without further Attorney Fees or all Representation before the DAAD until they get back on the road. In that regard, I make my money winning these cases the first time, so I have every bit as much incentive to get my Client back on the road as they are anxious to get there.